The early aid was immediate and direct. It came in the form of ships from the US Great White Fleet, which was circumnavigating the globe and, at the time of the quake, found itself in the “home stretch,” as it were, of a cruise of 43,000 miles with 16 modern warships, employing 15,000 men in a brash display of young US sea power. The cruise lasted from December, 1907, through February, 1909, and was under the command of Admiral Charles S. Sperry. The Great White Fleet went from Hampton Roads, Virgina, around South America and up to San Francisco; then, across the Pacific to Australia, the Philippines and Japan, and then across the Indian Ocean, through the Suez Canal, west across the Mediterranean, through the Straits of Gibraltar and back home across the Atlantic. The fleet was in Egypt when it received news of the Messina earthquake. The flagship, Connecticut (in the photo insert, above), with support vessels, arrived in Messina on January 9, 1909, with thousands of pounds of food, medicine and temporary shelters for survivors. About 17,000 persons were pulled from the rubble, their lives saved by the heroic efforts of the combined search and rescue crews of the US ships and of vessels of other nations that were near Messina at the time of the quake. 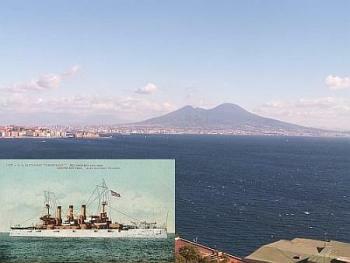 The US ships docked at the port of Naples during operations, and their presence is noted in the January issues of il Mattino, the Naples daily newspaper. The fleet stayed until late January and then left for home. In January, 2009, 100 years after the fact, ceremonies were held in Messina to commemorate the international effort that helped the city through the tragedy. I really do wonder what happened to Theodore Roosevelt Lloyd Belknap Palmieri. I hope he had a fine life. *see American House Building In Messina And Reggio: An Account Of The American Naval And Red Cross Combined Expedition (1910) by Reginald Rowen Belknap, pub. G. P. Putnam's Sons, New York and London.